One of the best things to have when you’re managing public library work are sets of procedures for your employees to refer to when needed. Not only are they helpful for your staff, but as a manager who is writing them you get an interesting glimpse into workflow. You learn how to think step by step and try to simplify things. 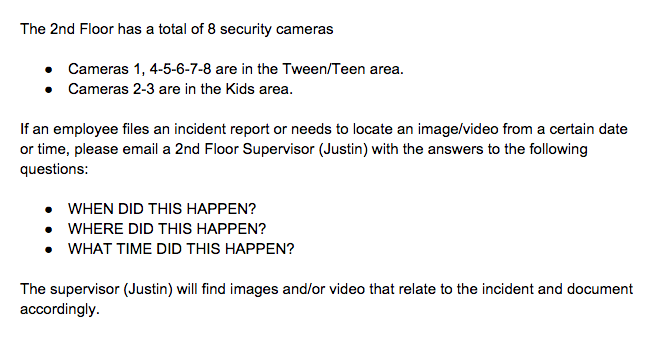 Here’s a screen capture of a procedure regarding security cameras. Sure, writing procedures won’t be the most fun you’ve ever had as a librarian but I will say this: they’ll help you manage your time, your staff, and aid in creating a positive atmosphere at your library location. 2014 was the year where I noticed my personal life/work life balance was way off. I worked pretty hard over the past year or so but I hadn’t noticed it. When I started having dreams about work that’s when I noticed that I should take a step back and balance everything out in my life. It has a been a great journey. When I’m away from work and libraries in general, I don’t think about them that much. I’ve always had a worry in the back of my mind that if I stopped thinking about libraries even for a moment that I’d become stale, old, and outdated. I was very wrong about this. Stepping back and taking your mind off of your work allows you to be even better than before. It gives you more patience. It allows you to stop and think before reacting. You grow to make better decisions. These decisions allow you to give your community the best that you have to offer. Everyone wins when balance is achieved. It is so much fun to sit in a room and brainstorm a ton of ideas. There’s probably some study out there that talks about how some kind of very awesome brain thing happens when you sit in a room and brainstorm. I’m not going to link to that study here because I’m being lazy and I don’t want to look it up. But you know what’s even better than sitting in a room and brainstorming? Having ideas, weeding out the ones that won’t work, and sitting back and letting things happen naturally. Now I’m not suggesting we stop brainstorming. It is good! But we’ve all fallen into the “what we brainstormed didn’t happen and now we’re stuck in a rut” trap. Brainstorming allows us to be free and dream big. But sometimes when we brainstorm we come up with things that just don’t translate well into the real world. When we get hung up on those things not working, we can get bummed out. That’s not fun either. I really like my work here on The 2nd Floor.I have had so many ideas about how to make this place work and how to make it both fun and enriching for the community. Some things have worked and some things haven’t worked. As I step into a bigger management role, I’ve had to put some of those ideas aside and hand over the keys to my colleagues to be the idea makers. Some of their ideas have worked and some of their ideas haven’t worked. It’s all good. We’re all trying our best. I really like disco music. Specifically I love Italo Disco. Websites like Mixcloud and Soundcloud are amazing places to find disco and dance music. Check it out! Here’s a mix of JAMZ that I’ve collected on Soundcloud. Smile! Dance! Enjoy life! Gotta say, I like procedure more and more. 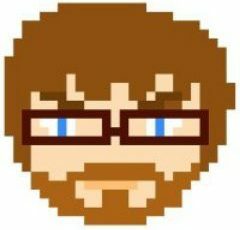 I increasingly see it as “the thing that frees my brain from making stupid mistakes and being filled with nitpicky details, so that I can actually think and exercise judgment”. You know? I have a couple of task list templates that I just copy-paste into my todo list every time I have a speaking engagement. Because I don’t *need* to spend a whole bunch of time brainstorming about all the logistical details I need to confirm with my host, and when I need to make various arrangements, and stuff. I can write that down, ONCE, and fix it if I discover errors, ONCE, and spend the rest of my time actually thinking about my talk. I think tl;dr works here! Yeah, everything you said=I agree with it. I just want to copy/paste it to save time.